Just because it’s winter it doesn’t mean that you have to put some of your favorite summertime activities on ice. Take for instance the Word Ice & Snow Championship in St. Ignace, Michigan coming up February 20 – 26. Here, kiteboarding and windsurfing – winter style – are the centerpiece of a week-long event. 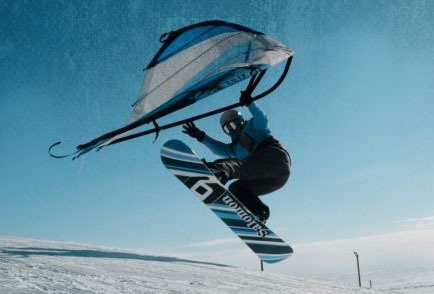 Donning skis, snowboards and even ice skates, competitors will utilize wind power to get their groove on. To quote a dear friend of mine, “Oh, the places you can go when you love snow.” Will be a great spectator event if you’re anywhere near the top of the mitt (Michigan’s Lower Peninsula). Check it out online at: www.wissa2012.com. On a more smaller, fun-in-your-own-backyward scale, break out the beach buckets and shovels for your little ones and build a snow castle. 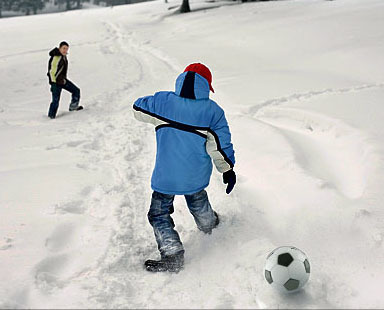 Or, strum up a game of what my family calls “Snoccer” — soccer in the snow! This entry was posted on February 16, 2012 by mittenkidz in Uncategorized and tagged fun with kids in winter, kiteboarding, sand castle, Snoccer, snow castle, snow fun, snow play, Soccer in the snow, St. Ignace, windsurfing, winter fun, Wolrd Ice & Snow Sailing Championship.